So much has changed in the Lujiazhui area! Gosh we cannot believe how many new buildings have risen and how many changes has been done in time for the Expo. The IFC Mall is very posh! Not our usual place to go… Lots of designer stores. Almost like Hong Kong. With the opening of the City Super also in the IFC Mall, there’s almost no need to fly down to Hong Kong to shop. Hopefully a really good bookshop will open in Shanghai, and then everything will be complete! And yes, the Apple Store is so cool. I posted more photos on Flickr. 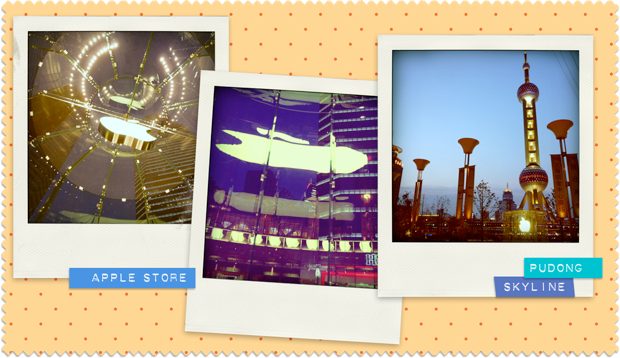 The entrance with the suspended Apple logo against the Pearl TV Tower is just so iconic! The glass entrance walls and staircase was just too cool. The place was packed for a Tuesday night! And overstaffed.